You'll need Word 2016 Preview and a OneDrive account. One of the more handy features of Google Apps is its ability to allow multiple authors to work on a document at the same time. With Word 2016, you can now do that as well. To be fair, co-authoring has been available in via Word 2016 and SharePoint for many months, as Microsoft noted in a blog post. Still, this is the first time you’ll be allowed to do that with OneNote. It’s part of the latest Office 2016 Preview release, Microsoft said Friday. 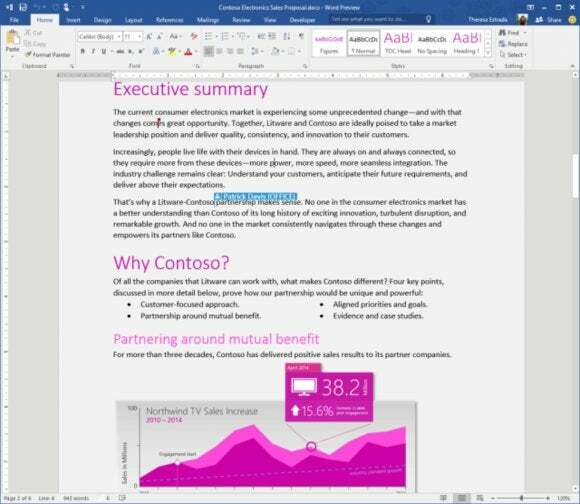 Co-authoring means that you’ll be able to work as you normally would in an Office 2016 document, making edits and adding information. But other people who have access to that document will also be able to make changes and edits in real time. You’ll see their cursor and what they’re typing in real time. And there’s also a “radar map” of who’s doing what, where, even if their edits don’t occur right next to yours. Both parties will need to agree, naturally. But once you do, you’ll be able to begin collaborating, er, write away. Why this matters: Not everyone needs to share documents, especially in real time. But if you’re down to the wire, and need to make some last-minute changes to a group project or other collaborative effort, seconds count. Eventually, Microsoft will extend this feature to the rest of the Office suite.